Student Association Executive Vice President Casey Syron has asked SA members to brainstorm ways to cut costs for students. Student senators have been asked to address one of the most most widely-discussed issues on campus – affordability. 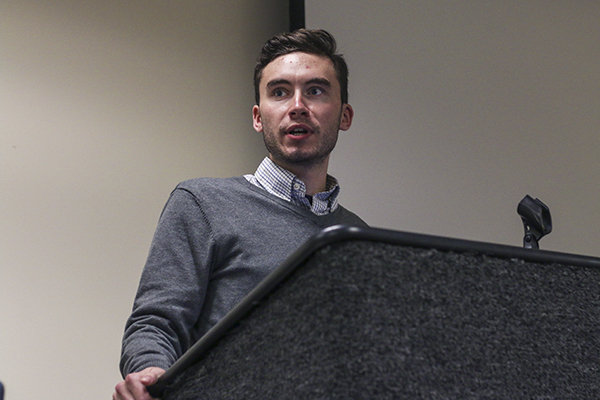 Earlier this month, Student Association Executive Vice President Casey Syron asked each of the SA’s committees to think of ways to cut everyday costs for students. The affordability initiative, Syron said, is a new way for committees to work together on a specific task and end up with more direct and potentially effective results. Affordability was the highlight of Syron’s platform while running for executive vice president. He said committees are working on ideas like increasing the number of affordable meals available to students. Sen. Thomas Falcigno, CCAS-U and chair of the SA’s leadership committee, said the SA plans to work with the University to figure out the most effective ways to trim costs. “I think it’s our responsibility as student advocates to make sure that we can try to reduce those costs and work with administration to basically say, ‘Listen, this isn’t working for students. Let’s figure out a way to make this better,’” Falcigno said. He said that advocating for affordability wouldn’t result in huge impacts, like lowering the cost of tuition, but more feasible plans could include things like finding cheaper textbook options for popular political science classes. Members of the SA also plan to increase the number of affordable meal options for students by asking local restaurants, like Chipotle or Panera Bread, to offer cheaper meals to students once a week. Falcigno also pointed out that applicants might consider tuition when comparing universities, but are often widely unaware of additional costs that he called “excessive” around GW, like the cost of food in eateries near campus. University President Steven Knapp has prioritized affordability for students since arriving in 2006. He created a task force on access and success two years ago, which proposed a test-optional admissions policy that officials adopted this summer. The SA endorsed the policy in its first meeting this year. Sen. Alyssa Weakley, SoB-U and chair of the academic affairs committee, also stressed the importance of making sure all students have the same access to resources. This article appeared in the November 16, 2015 issue of the Hatchet.